Costa Blanca is bigger than you may think… With a coastline of over 200 km, which is the equivalent of Birmingham to Leeds, there are a lot of areas to choose from! Costa Blanca, also known as the ‘White Coast’, is full of great entertaining towns and coastal areas that offer many benefits, from restaurants, championship golf courses to stunning beaches. The destination has been popular with UK buyers and holiday makers since our love affair with Spain started in the 1950’s. And with a population of around 1.9 million and 30% of those being expats, it’s no surprise more people are choosing to pursue the well known, desirable areas that include Denia, Calpe, Guardamar Del Segura and today’s focus, Torrevieja! If you don’t know much about the lively city of Torrevieja, you are missing out! The city is situated in Spain’s southeastern Alicante province and is traditionally known for its salt mining thanks to the two large salt lakes within its boundaries. The year-round resort has an average of 320 days sunshine each year, which makes it the perfect destination for a holiday home with guaranteed sun and blue skies! Residents can enjoy the Mediterranean lifestyle within the healthiest climate in Europe, as regarded by the World Health Organisation! This is due to its dry microclimate that provides noticeable benefits to sufferers of rheumatism/arthritis/asthma and heart-related problems. It’s difficult to highlight all of Torrevieja key benefits, but we’ll try to pick out a few of the best! A combination of the exquisite cuisine, friendly restaurants across the promenade, regular street markets and vast amount of independent bars, makes the town a highly social place to be. The unique selection means you can try somewhere new every day, including freshly caught seafood, Mediterranean dishes and traditional tapas treats! If you’re looking for something relaxing to do, why not explore the many beautiful beaches such as Playa de la Zenia? The white beaches are surrounded by cafes, so you can grab a cool drink, stroll on the promenade and enjoy the sun. For those more adventurous, there is a variety of water sports to have a go at! From jet skiing to parasailing and flyboarding, there are plenty of activities to keep you and your (grand)children entertained! The Museum of Sea and Salt (Museo Del Mar Y De La Sal) explores the history of the salt lakes through exhibits and model ships. The quaint museum offers free entry, however, we’d recommend having someone in your party who has fluency in written Spanish before you visit. For something a little different, the Cultural Society Casino of Torrevieja which sits in the heart of the town is a spectacular building to visit and enjoy a drink. The Parque De Las Naciones offers a tranquil little oasis away from the town centre. There is plenty of affordable properties available in and around Torrevieja, and thanks to the huge selection of amenities around the town and close proximity to Alicante airport, the area offers good rental returns. There’s a property to suit everyone! From a selection of properties in the town centre that are close to shops, restaurants and bus stops which is ideal for retirement, such as these 2 bedroom apartments for just €129,000. To properties that are great for a holiday home, which come with great views, spacious living areas and access to a pool, such as these brand new apartments for €152,000. One key benefit of Torrevieja is that it’s a city with a beach; so you have the choice of stunning properties that have sea views! Imagine watching the sunset from your terrace, like these semi-detached villas or living just 800m from the beach, like these townhouses? Torrevieja is a great city for permanent residence and there is a variety of homes which offer something extra special for a slightly higher price bracket! This 3 bed villa has sea views, is within 900ms of the beach and is close to local amenities! Visiting Torrevieja is low-cost and easy, with direct flights to Alicante Airport or Murcia Airport from most UK airports such as Southampton, Newcastle, London, Edinburgh, Cardiff, Manchester, Birmingham and Bournemouth. The travelling time is minimal and transfers once landed are around a 40 minute drive along the fantastic coastline! Get in touch with our expert team at Spanish Legal Homes to view any of these properties! Call 01202 971614 or email sales@epspain.com. Why not go out to Spain to view property? 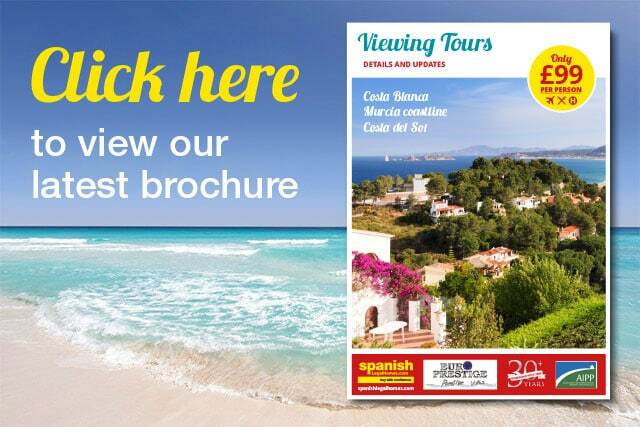 Learn more about Costa Blanca Viewing Trips!